The 2017 harvest in Bordeaux is the smallest in over a decade, with the equivalent of 300 million bottles destroyed due to last year’s frosts but while some appellations were effectively wiped out, a very few enjoyed bumper crops. Building on his initial look at the state of the vintage late last year, local winemaker and commentator Gavin Quinney has dived further still into the minutiae of the losses both at the macro and appellation level. With the harvest reports from the region’s 6,500 growers now all submitted, it is clear that the 2017 vintage will be 350 million litres (roughly 467m bottles), 40% down on the (historically large) 2016 – a loss of some 300m bottles. 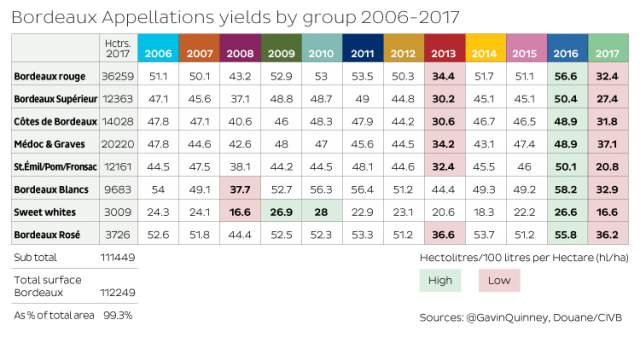 The crop is also 33% smaller than the 10-year average and smaller overall than the 2013 as well. As he goes onto say, Pauillac, St Estèphe and St Julien actually managed larger crops in 2017 than the average over the five preceding vintages. In Pauillac 2017 yields were 46.2 hectolitres per hectare; in St Julien they were 44.3hl/ha and in St Estèphe 49.7hl/ha. In fact, Pauillac had a historically large crop in 2017, bigger even than the 44.9hl/ha harvested in 2016 and far, far above the 29.8hl/ha from the other severely hit vintage this decade, the 2013. St-Estèphe too came close to matching its 2016 crop and was comfortably above the lows of the 2013 harvest. On the other hand, while the news from those three AOC is not disastrous, look anywhere else and the toll is much, much heavier. For Margaux, Pessac-Leeognan, Saint Emilion’s grands crus and Pomerol, 2017 represents one of the smallest harvests in a decade; the smallest in fact in all but Margaux, with the Right Bank communes especially badly hit. Move outwards to the communes producing Bordeaux rouge, rosé and blanc, Côtes de Bordeaux, Médoc and Graves and so on and the reports are grimmer still. 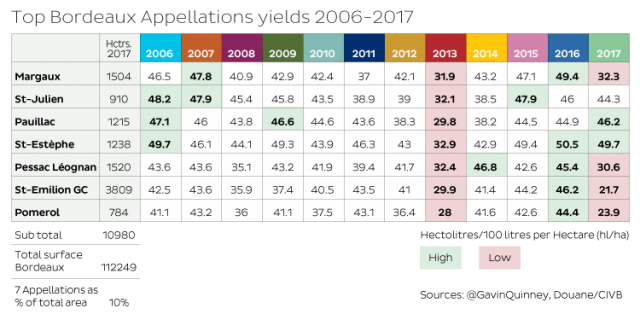 Although the Médoc and Graves and Côtes de Bordeaux managed slightly larger crops than in 2013, all the rest are smaller – for Sauternes and Barsac in particular – and they are all, without exception greatly reduced when compared to 2016. Overall, the worst hit communes were: Lalande de Pomerol, St Emilion’s grands crus and satellites such as Montagne and Lussac, Côtes de Castillon, Moulis, Barsac and Sauternes (already covered by the drinks business here). This is, by its very nature, still a broad overview and actual volumes produced by individual estates within both badly and barely hit AOC are sure to differ considerably. It is also not a commentary on the quality of the wines being produced, the proof of which is still to come later this spring. Quinney’s full report can be read on the Liv-ex blog here or Jancis Robinson MW’s site here.